Last year I was Christmas jumper obsessed. I became this weird acrylic hoarding Mum that would jump for joy at the mere glance of a pom pom bauble or ten. Henry never went a day without a little festive knit and this year, I didn't want to disappoint Mummy's little Elf. But this year I have to say, I've been a little disappointed. There has only been a handful of jumpers that got me excited and I found myself seeing the same designs in shop windows. But thankfully I did find some goodies, so without further ado... over to you Henry. Henry's 1st homage to Wham comes from Sainsbury's and I have to say, I can't take credit for this little find. My husband found this way back in November and I have to say, its one of the best for quality. I love the Home Alone style print and its super super soft to touch. If you have a little girl, please check out the Cream Robin Jumper, it is super pretty and would look gorgeous with little knitted Christmas leggings. Why oh why don't they do them in my size? 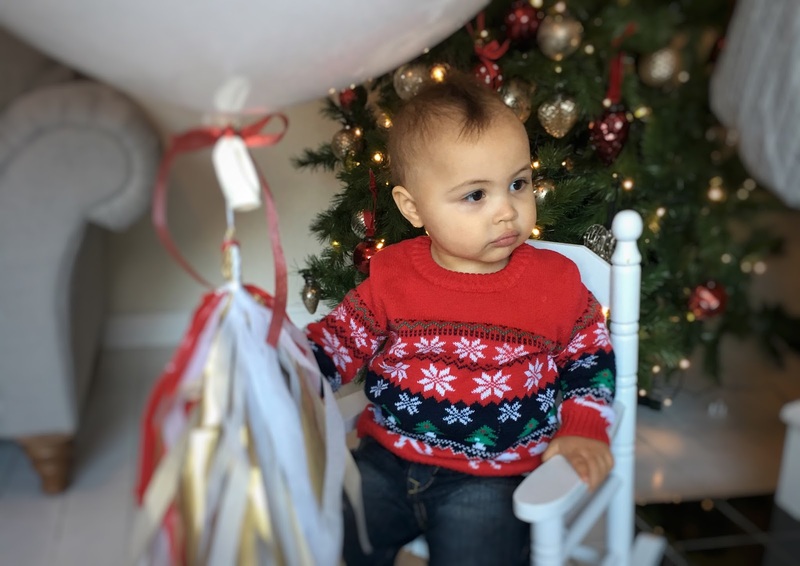 The next little jumper was gifted to Henry by the gorgeous buying team at Very. They magically combined this years love obsession of dinosaurs and added a twinkle of snowflake magic to create this fairisle knit. I love how super bright this jumper is and I love its little boyish charm with the dinosaurs. I teamed it with these Mini V jeans with braces. & just like his Dad, I had to roll up the hems. Ah he will grow into them (unlike his Dad). Rudolph the red nose reindeer... had a very snuggly knit. You might want to sit down for the next little reveal. Rudolph has had a glam squad make-over. Mover over Dancer, Prancer and Cupid, there is a new Pom Pom loving Vixen in town. (ha see if you can name the rest). Rudolph comes fully embellished with giant knitted pom poms and if you press his nose, he flashes. What is not to love about that? This jumper came from Tesco and I have to say there PJ sets were also incredible for the little ones. Last but no means least is this little primary coloured Christmas jumper comes from Asda. Henry wore this jumper today for nursery and he looked gorgeous. A gift from his Nana Henry looked snuggly, which is a bonus when it has been incredibly cold. Unfortunately its sold out online, however you can still pick them up in store. In the pictures above he was telling his Little Elf (he doesn't have a name yet) that he smelled ("poor") Henry sang to him. haha. Maybe he thought his Christmas jumper wasn't as good as his.